Our amazing trip From Shanghai to North Sichuan and Gansu came to an end when we reached our last stop: Beijing. China's capital, political and historical center. Leon lived over 1 year in old Peking when he first moved to China in 2011 so he knows his way around the sprawling districts. I'd only been here once: the winter of 2012 where I during a freezing cold weekend of December explored the traditional tourist-sights and to some extent must-sees with my Swedish friend Joanna. Our 2 day itinerary was something like this: The Summer Palace, The Olympic arena, the Great Wall, Temple of Heaven, Tianmen Square and The Forbidden City - the classics. Because it's always fun with a little flash-back and because Beijing's most famous spots probably look the same today, I dug out some photos from our trip 3 years ago... Oh how time just flies! This time I was super excited to go here in late summer and thus a less cold season... And to be accompanied with the love of my life with whom I could discover some alternative wonders of Beijing! A 50-year old decommissioned military factory area that was converted into a massive art district in the early 2000's, "798" is an awesome way to spend a full or half day. It features all the old factory buildings, train yard, chimneys, pipes etc with unique architectural style, mixed with outdoor art, installations, graffiti and whatever else happens to be going on. There are tons of galleries, large and small, featuring permanent and changing exhibits - most of which are free of charge! There is also a thriving artistic community, cafes, boutiques and designer stores. Situated in the city center, it is a beautiful royal landscape garden with a small hill offering the city's best views directly over the Forbidden City. The mid summit of the hill is the highest point in Beijing. Looking from the peak, you get a 360 degree view of the city and scanning the horizon on a clear day youget to see the high-rise buildings of Chaoyang CBD, Haidian and the Olympic village like Birds Nest Stadium. Visit the Hutongs (residential areas of old-Beijing) for a local meal, a freshly brewed craft beer or a cockail at Beijing's best cocktail bar. The funnest and often quickest way to get around downtown Beijing and the hutongs, for sure. Remember: haggle and then agree price in advance. Clearly establish exactly where you are going and make sure you are actually there at the end of the ride. Then sit back and enjoy! This was the main reason we ventured North to the 'jing on this trip: to attend the wedding of Leon's good snowboarder mate Nate and his beautiful wife Da Jing. Nate is from Seattle, USA and Da Jing is from Beijing and they met "shredding" (aka snowboarding) at the local indoor snow field just outside Beijing. Held in a classical Ming dynasty compound on the outskirts of the city, the bridal party all wore the traditional costumes for the ceremony. 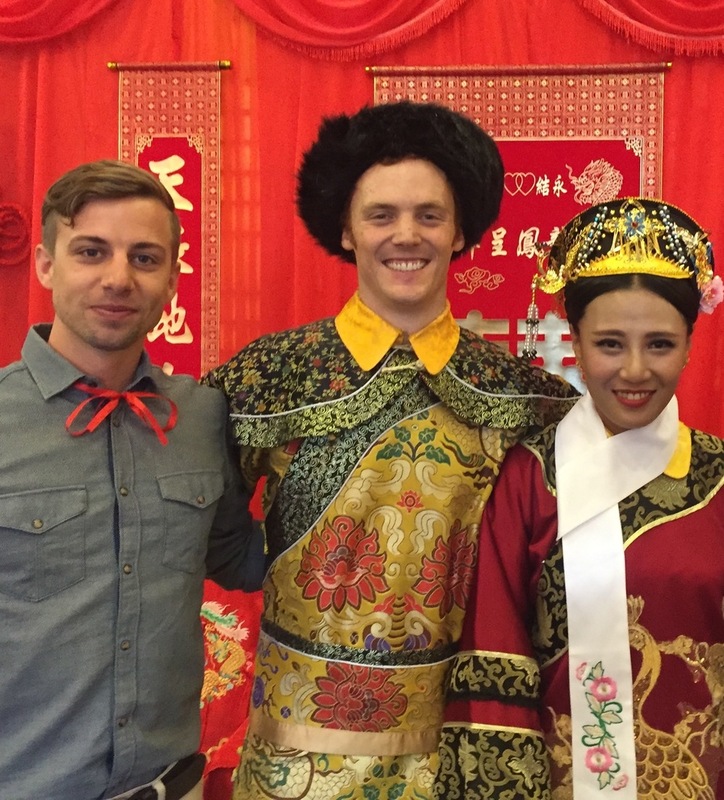 OK if your local Chinese friends don't happen to be getting married when you visit, try to find yourself a way to connect with the friendly northern culture. Grab an outdoor table at a small bar or family restaurant, a few bottles of Yanjing beer or ErGuoTou baijiu, cry "gemen'r, ganbei!" (= 'cheers, bro') to your nearest local and see how the night unfolds!